Lead your family on a Black Hills wintertime adventure and experience dramatic landscapes and abundant wildlife as you trek over pristine snow in a pair of personal or rented snowshoes. Snowshoeing is a great family activity, requiring little skill and just a pair of shoes, head down the trail for some winter fun. Explore sections of Centennial and Mickelson Trails, or break new paths in Black Hills National Forest. 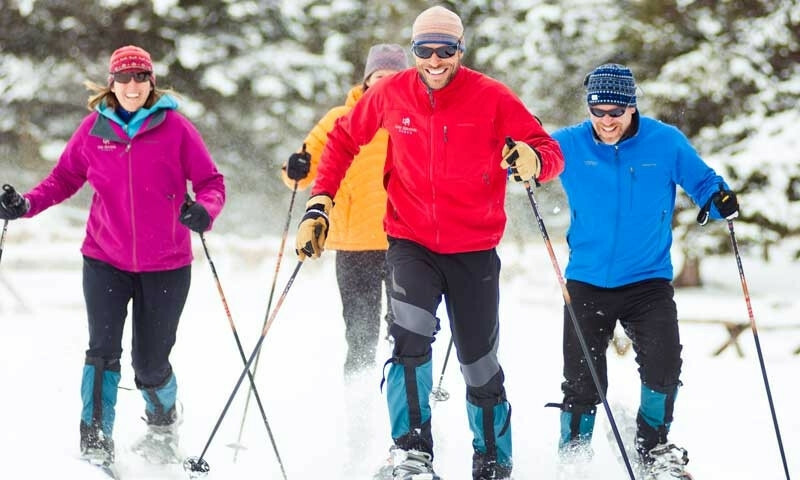 Find snowshoe rentals at local ski shops, lodges, and outdoor recreation retailers. Black Hills National Forest is the primary destination for a fantastic snowshoeing opportunity. Thousands of acres await your exploration, with 60 miles of trails designated for shared cross-country ski and snowshoe use. Unlike many recreational activities, snowshoeing is a relatively easy and inexpensive sport. Don’t worry if you don’t have your own shoes – ski resorts, private lodges and outdoor sporting goods stores sell or rent snowshoes. Trek a section of this 109-mile trail, with gentle, family-friendly slopes, it’s a perfect place to test your snowshoes. Featuring: 15 trailheads with parking areas, toilets, benches and shelters. Running 111 miles, from Bear Butte Lake to Wind Cave National Park, this trail traverses a diversity of landscapes, featuring a section through Black Elk Wilderness, full of wildlife and spectacular scenery. Try these designated snowshoeing areas. Download Trail Maps Here.